A new ResearchKit API can monitor Watch users for tremor and dyskinesia. 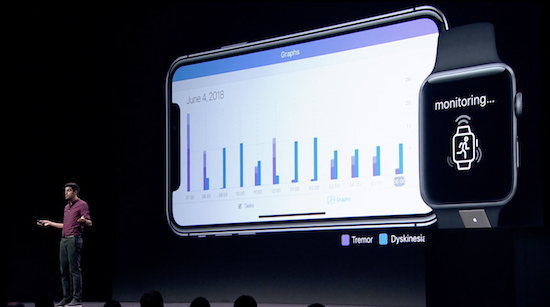 Apple has added a new API to its ResearchKit framework that will allow apps to monitor Watch users for signs of Parkinson's disease, 9to5Mac reports. The API will be able to track two symptoms associated with the movement disorder -- tremors and dyskinesia -- continuously throughout the day. Apps monitoring these two activities would then be able to display the recorded data, showing instances of the symptoms per day, hour or minute. Both Apple and outside researchers have been working on ways to use ResearchKit tools to monitor mobile device users for a range of diseases and disorders. Scientists at Cardiogram, for example, have demonstrated how the Apple Watch can be used to spot signs of a stroke through irregular heartbeats while researchers at Stanford teamed up with Apple to study how the Watch can be used to detect arrhythmias. Others have used ResearchKit tools to aid in the detection of autism, melanoma and epilepsy. Apple will make the Movement Disorder API available to developers with the second developer release of watchOS 5, 9to5Mac reports, and it has released a sample study app on its ResearchKit GitHub page.